Your teeth are meant to last a lifetime. Years ago diseased or injured teeth were usually pulled. 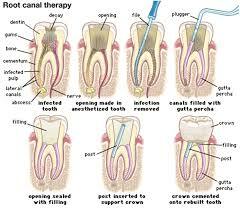 Today a tooth can often be saved through root canal treatment. The pulp is the soft tissue inside the tooth that contains blood vessels and nerves. When the pulp becomes inflamed, infected or exposed treatment is needed. The most common causes of pulp inflammation or infection are a cracked or chipped tooth, a deep cavity or filling, or other serious injury to the tooth. All of these can allow bacteria to enter the pulp. If damaged or infected pulp is not removed, the tissues around the root of the tooth can become infected. Pain and swelling are often the result. Even if there is no pain, bacteria can damage the bone that holds the tooth in the jaw. Without treatment, the tooth will have to be removed. Once a root canal procedure has been successful, the tooth will need to be restored with a crown to strengthen the compromised tooth. When properly restored the tooth should last for many years.